WE ALWAYS STRIVE TO DELIVER OUR BEST AND PROVIDE THE WORLD CLASS PRODUCTS & SERVICES TO GIVE YOU A BETTER EXPERIENCE. Our Vision is to provide solutions which always meet your needs and give you a better experience. Our Vision is to provide by engineering and integrating our technology and be a leader & provide unparalleled quality engineering solutions and services to our clients across India. Our Mission is to provide cost effective Swimming Pool solutions. Our Mision is to provide swimming pool industry by providing cost effective solutions through our best quality and rates so people can afford it in India. 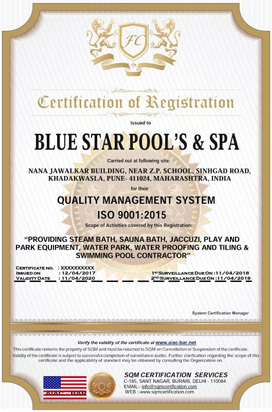 Mail us @ bluestarpools9spa@gmail.com OR call anytime +91 9860877659.